Atomcalc is an all-purpose planning and modelling program contained in a plug-in 4K ROM, which fits into the utility socket of a standard Atom. It is very easy to use; if you can use a calculator, you can use Atomcalc and no programming skill is needed. 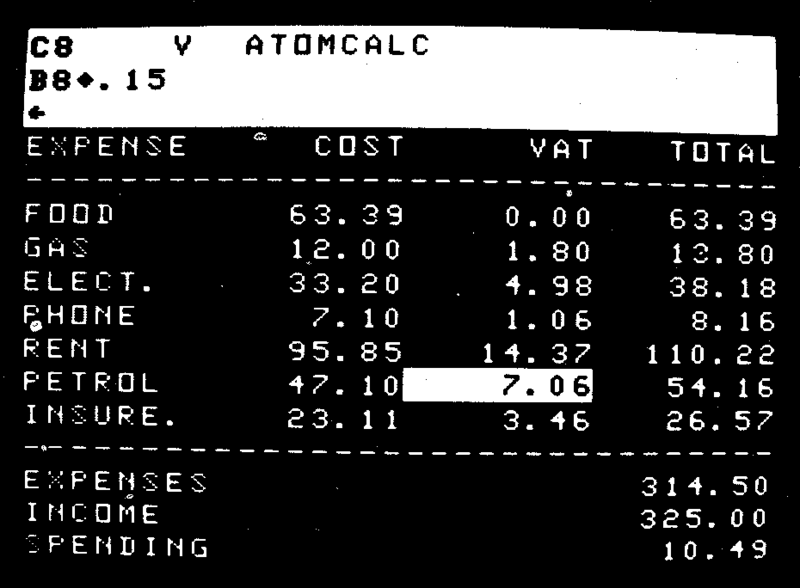 Atomcalc creates a grid of up to 62 rows and up to 255 rows, like a ledger. Each position can contain a label, a number or a calculation. You set up a series of automatic calculating functions like totalling or percentages. Then fill in the columns with your figures and the program produces the answers. If you want to change one figure in the calculation, it immediately changes the relationship of all the other figures involved. So, for example, you can see what effect on profit a 5% increase in sales might have or a 10% increase in production or a 3% drop in transport. Atomcalc comes complete with a 30-page Users' Guide, with financial and scientific examples.